The INTEGRA-7’s SuperNATURAL powers also reach beyond acoustic instruments. It’s loaded with SuperNATURAL synth tones that meticulously recreate the fat sound of beloved vintage synthesizers, their expressive filters, and unique envelope behaviors. Hundreds of PCM waveforms are onboard as well, providing a treasure trove of classic digital-synth sounds prevalent in the ’80s and ’90s. You can even edit the sounds intuitively on an iPad with the dedicated editor app. This exciting new sound processing can also be applied to external audio; connect an audio player or instrument to the INTEGRA-7’s inputs and immerse it in Motional Surround. Adjust the parameters in real time via MIDI, as well as with the dedicated iPad app. Motional Surround supports two-channel output, so you can experience the effect with just two speakers or headphones! 5.1-channel output is also supported for maximum impact with five speakers and a subwoofer. The INTEGRA-7 is packed with innovative and powerful features, including a Tone Finder wizard that organizes the 6,000-plus onboard sounds into logical categories for quick location. Simply press the dedicated Tone Finder button and choose your category; once you find a sound, press the volume knob/button to preview it. The preview plays a suitable phrase for each sound, so you know what kind of articulation behavior it’s able to produce. Other noteworthy features included an ultra high-quality GM2 sound set (uses all four virtual slots) for playing SMF files via external sequencers, six additional SuperNATURAL sounds (uses one virtual slot each), a front-panel USB memory port (which lets you conveniently store your settings on a USB thumb drive), and a custom iPad Editor App for iPad users who wish to control the INTEGRA-7’s synth parameters, part mixer, and Motional Surround remotely, as well as selecting sounds and reading/loading the 16-part Studio Sets. 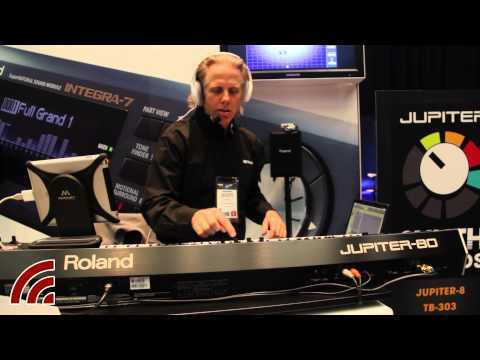 Perfect partners for the INTEGRA-7 are Roland’s new A-88 and A-49 MIDI controller keyboards. The SuperNATURAL button on the A-88/-49 automatically assigns the INTEGRA-7’s most appropriate parameters to the mod lever, knobs, and D-BEAM for controlling the selected SuperNATURAL sound.